With just a couple of weeks left until the start of a new school year, a lot of moms are out in force to get their kids’ back-to-school shopping done. But while they may be looking for deals, they won’t be turning to social media to find them, according to a new survey from PunchTab, which provides a platform measuring social media engagement for digital marketers. In a survey of about 500 mothers, 75 per cent of those polled said they did not plan on using social media to help them decide what to buy for their kids during the back-to-school shopping season. Out of those who said they would be using social media, 22 per cent of them planned to concentrate on Facebook, nine per cent on Pinterest, four per cent on Instagram, and just one per cent said they would be using Twitter. Still, the overwhelming majority of respondents seem to be doing their shopping in physical locations, rather than shopping online. Eighty-five per cent said they would be shopping at a brick-and-mortar store, but about 33 per cent of respondents said they wouldn’t be doing any of their shopping with an e-commerce site. About 52 per cent said less than half of their shopping would be done online, while 14 per cent said they guessed they’d be doing more than half of it online, but would still be visiting physical stores for some of their needs. However, that doesn’t mean these moms will be shopping completely unaided by technology. Ahead of hitting the stores, about 48 per cent of respondents said they would be using their smartphones to search for coupons and sales, while 30 per cent said they would be doing price comparisons. Another 20 per cent will be using their smartphones to check out what stores have, before they actually visit them, 18 per cent will be looking up items and researching them, and 16 per cent will actually be buying items from online stores with their mobile devices. About 37 per cent said they don’t plan on using their smartphones to help them with their shopping trips. For moms who were entering the stores, 46 per cent said they would be using their smartphones while inside to look for mobile coupons. Eleven per cent would be looking up online reviews, while another 11 per cent would be checking their status for the store’s loyalty program. Just three per cent said they would be using a mobile wallet or some other payment application to make a purchase, and 41 per cent said they had no plans to use their smartphones in-stores at all. For B2C marketers, there’s definitely a lesson to be learned here among this demographic. 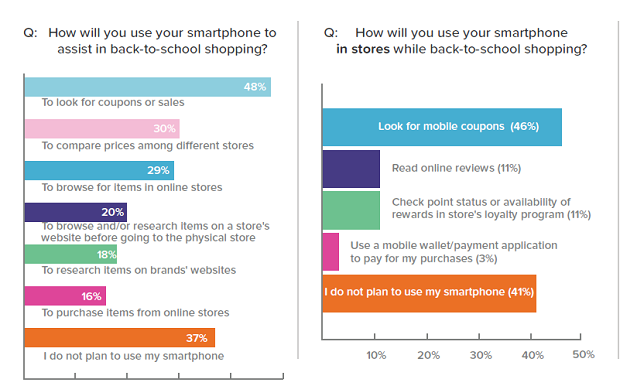 While moms don’t seem too keen on online shopping for their kids’ back-to-school supplies, they’re really interested in mobile coupons. Forty-one per cent of respondents said they felt this was very important, 25 per cent said it was important, and 23 per cent said it was somewhat important. Just seven per cent said they felt it wasn’t particularly important, and four per cent said mobile coupons didn’t matter at all. For marketers looking to reach this demographic, this is why it’s important to know what they’re looking for, and how they would like to receive it. While receiving discounts offers on their desktops might be useful, what works best for moms seems to be mobile. For more, check out the report from Punchtab.